The Bundesliga has reached its halfway point for 2017/18, which means it’s time to take stock of who’s doing best in Official Fantasy Bundesliga. 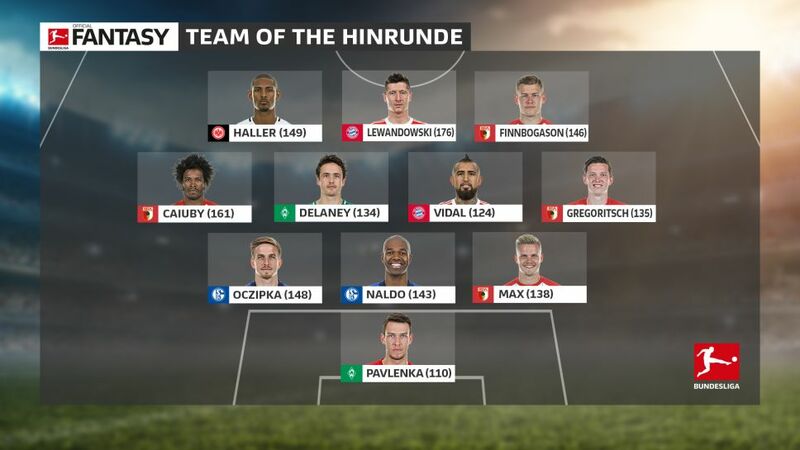 That Robert Lewandowski leads the pack may be no surprise, but who would’ve predicted four Augsburg players in the top XI? Who else has made the cut after 17 games? “What is the goalkeeper of the team sitting third from bottom doing in this team?” we hear you ask. Well, that team currently has the Bundesliga’s third-best defence going into the winter break, and that is largely down to their summer signing from Slavia Prague. Only Cologne’s Timo Horn (108) has faced more shots than Pavlenka (96), yet the Czech international has saved a Bundesliga-best 79 per cent of those attempts to beat him. Yet to miss a single minute of action this season, his five clean sheets are only bettered by Bayern Munich’s Sven Ulreich and Borussia Dortmund’s Roman Bürki. Tipped by many this season as strong relegation candidates, Augsburg have been one of the surprises of the campaign. Only once in their history have they had more points at the halfway stage, and full-back Max has played a telling contribution to that success. Featuring for all but ten minutes of the campaign so far, the 24-year-old’s nine assists are by far a league best. The Olympic silver medallist from 2016 is the league’s most creative influence so far, teeing up 65 Augsburg efforts on goal. Add to that four clean sheets, and it is clear to see why the son of former Bundesliga top scorer Martin Max has not only put a smile on the face of his Fantasy coaches, but also caught the eye of Germany boss Joachim Löw. Featuring in all but one game this season due to illness, the summer signing from Eintracht Frankfurt has been a revelation for a Schalke team who themselves have taken the Bundesliga by storm and sit in second over the winter break. Five clean sheets have all come with 201 challenges won and setting up 54 shots on goal – both are highs among the Royal Blues. Another whose name has been mentioned surprisingly often in the first half of the season, the Austria international appears to have found a home for himself at Augsburg – already his fifth German club. Since joining from Hamburg in the summer, the 23-year-old has netted eight goals for the Fuggerstädter, three more than his previous best for an entire Bundesliga campaign. A number of those strikes have been crucial to Augsburg’s run, with three of them turning out to be match-winners. His 53 attempts on goal are topped only by Lewandowski and Pierre-Emerick Aubameyang. If Jupp Heynckes has orchestrated Bayern’s rise to the top of the table off the pitch, his Chilean bulldog midfielder has been the virtuoso performer on it. The midfielder is the record champions’ top scorer behind Lewandowski with five goals, including four in four consecutive games for the first time in his career. Two assists have also come with those five strikes, which is already his best goals tally for an entire season with the Bavarians, but it is the importance of those goals that has made ‘El Guerrero’ stand out from the crowd. Three of his strikes have put Bayern 1-0 up, and each time they have converted that into three points. An ever-present for the Green-Whites so far this season, the Dane with American citizenship has been a shining light in a Bremen side struggling in the lower regions of the table. His 36 efforts on goal are a club-high, as well as his combined 56 shots and assists for shots. With three assists and a goal to his name, Werder are yet to lose when he has had a hand in a goal. However, it is for his love for and ability in a challenge that ‘Tenacious D’ features in this Team of the Hinrunde with just short of 200 won. Yet another who appears to have found his feet at Augsburg this season. A serious knee injury kept him out for much of last term, but the Brazilian has been a points machine for Fantasy managers in 2017/18 – only trailing Lewandowski. His 493 challenges are second only to Sebastien Haller, winning over half of them. The 29-year-old has featured in every Bundesliga game so far this season and has already equalled his personal best total of four goals for an entire top-flight campaign. The fourth Augsburg man to feature in this team, the Iceman is the only player this season to have netted two hat-tricks and currently the closest challenger to Lewandowski and Aubameyang for the Torjägerkanone. With 11 goals to his name, the Iceland international has already smashed his previous best of seven goals for an entire Bundesliga season. Ever the team player from a nation of only 330,000, the Reykjavik native also has two assists and has set up his teammates for shots of their own on over 20 occasions. A man who needs no introduction, and who knows better than anyone how to carry out that most basic but precious footballing principle: Putting the ball in the back of the opposition net. The Poland international has already done that 15 times in 17 games to equal his personal best for a Hinrunde. Only failing to find the back of the net in five Bundesliga games so far, his 70 attempts on goal is a league-best for the leading points scorer in Official Fantasy Bundesliga. Instrumental in Bayern’s charge to the top of the league table, Lewandowski now also finds himself at the top table of Bundesliga goalscorers with 166 goals to his name, placing him in the all-time top ten. Frankfurt have not been prolific scorers this season with no game won or lost by more than a one-goal margin, but Haller has been a prominent part of their attacking play. The summer signing from Utrecht has quickly settled into Bundesliga life with six goals and two assists to his name. The Eagles have never lost when their top scorer has had a hand in a goal, but it is the 23-year-old Frenchman’s physicality that makes him such an asset: No player has contested more challenges than the Eintracht man (520), bringing you a bumper load of Fantasy points even when he is not finding the back of the net.